Get cosy while listening to the power of the thunderstorm. With 3D sounds! The eye of the storm is the point at a storm’s center where all the powerful natural forces cancel one another out, leaving an oasis of calmness – and that’s exactly how you’ll feel after listening to this wonderfully relaxing CD. Put the CD on your computer or music player, and let it conjure up a storm in your bedroom, lounge or living room. From the comfort of your home, you’ll hear the approaching storm, heralded by wind and rain. A distant rumble of thunder gradually becomes louder, till soon it cracks and booms excitingly around you. Then as the storm moves away, everything becomes calm and quiet once more. And as it does the excitement of the storm fades too, leaving you relaxed, refreshed and revitalised. As the storm ends, you’ll picture the warm sun coming out again, driving away the last of the rain. 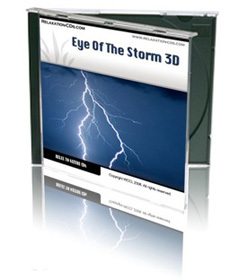 And you’ll be ready for whatever adventures life has in store for you next – secure in the knowledge that your ‘perfect storm’ is always available on this CD any time in future you need to draw on its amazing power!